Now you've seen the proportions you can estimate the ratio's between the body and the arms. Because the orang utang has quite a lot of belly, I left out the cocktail-stick and started right on with the iron wire. 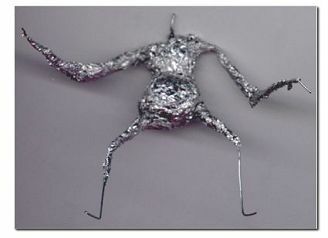 I started with the arms and legs, made of seprate pieces of wire. Then I added the body by wrapping some wire between the arms and legs, starting at the legs, then up to the arms, to the right, back to the legs, round again, up to the arms, round and finally left a bit sticking out for the head. Left is a sketch of the wire frame with next to it the wire frame itself. Take a look at the pictures on the preparation page to see if you got the lengths right. Bend the armature to match the pictures. You can see it can grab it's own feet just like in the picture in the chair. 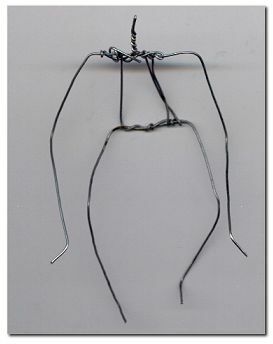 You can always untwist part of the wire on the armature to redo a part of it. Cover the wire frame with tinfoil. 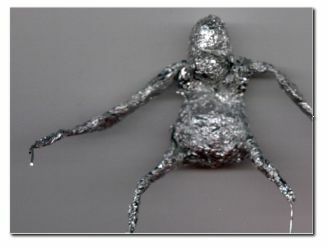 Try to fold the tinfoil over the arms and legs more than twist and roll it to create a sort of long sleeve effect. That makes it easier to model the long hairs on the arms later on. Use crammed up tinfoil to fill the belly. Make it into a nice potbelly. Use two smaller pieces of crammed up tinfoil to create the chest. Cover it with a larger piece of tinfoil to keep it together. Use another ball of tinfoil to create the head. It's kind of oddly shaped. Again, look at the pictures to see the exact shape of the head. Stick it on the bit of wire stat's still sticking out on top. Bend it slightly downward to the head rest on the chest between the shoulders.